As well as racing in the WEC, Button has also been competing in Super GT this season, driving the Team Kunimitsu Raybrig Honda NSX. Things have probably gone better than expected, too - he and teammate Yamamoto finished second in the first race of the season and Button managed a maiden win at round six in Sugo, despite a close call with a course car. Heading into the final round at Motegi, the duo were level on points with Ryo Hirakawa and Nick Cassidy, essentially meaning that whoever finished in front of the other would win the title. It was an incredibly tense finish, too. When Button took over from Yamamoto after the pit stops he found himself running third as Hirakawa rapidly started to make gains through the field. With a few laps to go, the gap between the two title protagonists was just a couple of seconds, leaving Button under enormous pressure as they lapped slower GT300 traffic. But given his vast motorsport experience, Jenson isn’t normally one to buckle under pressure and he held on to finish third in fine style, winning the championship in the process. It’s a particularly impressive feat for Yamamoto, who has now won both the Super GT and Super Formula championships in the same year - only the fourth person ever to do so after Richard Lyons, Satoshi Motoyama and Pedro de la Rosa. On the other side of the coin, Cassidy was the driver who lost out in both championship fights in the space of two weeks. It also marks the end of a tough time for Honda, which hadn’t won a GT500 title since 2010. 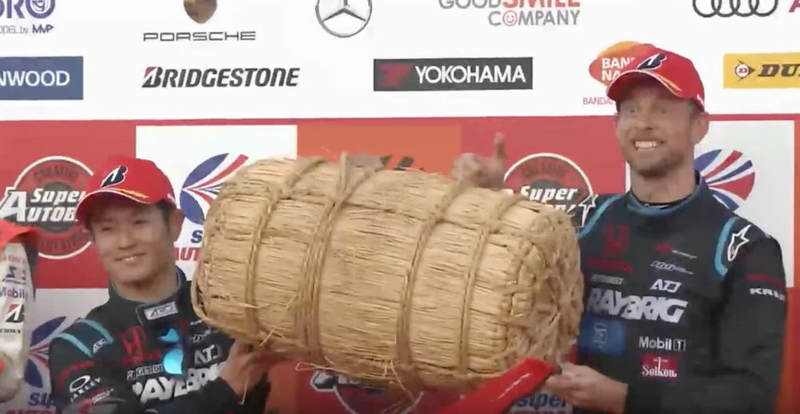 You've got to love Super GT podiums - yes, that is a massive basket of rice! As for Button? 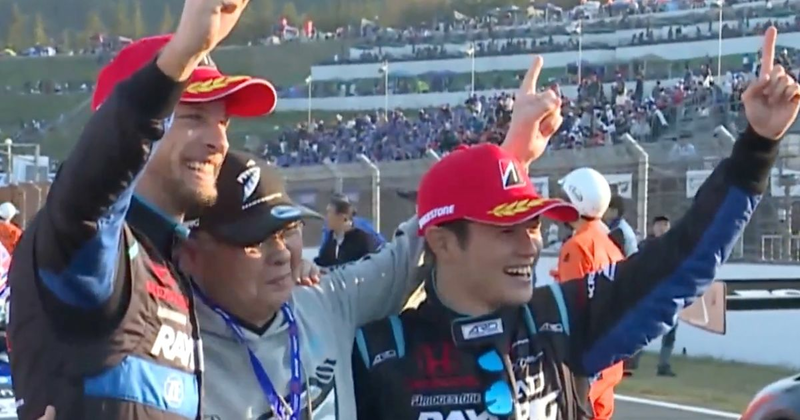 He becomes the first rookie to win the Super GT championship since 2005 when another F1 legend - Tora Takagi - took top honours, also driving for Honda.